During my years of painting people’s homes, I’ve learned that small spaces don’t have to be boring or go unnoticed. All it takes is a little paint. By adding paint in strategic places around the home, you can easily and inexpensively transform a space. Plus, there is a good chance you could accomplish at least one of these eight painting projects during the course of one weekend. Here are eight spaces to consider painting and my tips and tricks on making even the smallest places have a big impact. When a guest arrives, their first impression is based on your home’s exterior and the front door. Realtors call this curb appeal. But the very next thing guests will notice is the area right inside your front door, so you should use it to make a statement. If your home has a formal entry, choose a paint color that is one to two shades darker than the next room. A darker paint color in the entryway can make the space feel more inviting, like a warm hug. If your home has an open floor plan without a defined entryway, use paint to create one. Try a bold color on the wall surrounding the front door and an adjacent wall as visual borders for the entry. Small bathrooms might appear to be limited when it comes to design, but they can easily be transformed with a quick paint color update. How do you pick a color for this small bathroom? Look around your home for spots of color that crop up in your art or drapes. For example, a living room that is mostly beige with blue accent pieces would coordinate well with a bathroom painted in that same shade of blue. Dark colors also have been trending with homeowners I’ve worked with lately. To offset the dark nature of the paint, we typically recommend keeping the other design details, such as the floors and sink, light to make sure the room still feels open and bright. Worried one color will overwhelm the small space? Consider installing a chair rail as a natural divider. Then paint the lower portion of the wall in a statement color while leaving the wall area above a neutral tone. Whether the bookshelves in your home are built-in or freestanding, you can easily create style with paint. Remove the shelves from the surround and paint the back wall of the case. Don’t be afraid to go bold with your paint color, because once the shelves and objects on the shelves are in place, your color choice will seem more subtle. You will get an instant pop of color without being too in-your-face. This space is often overlooked when it comes to paint, but a fresh coat of paint on the walls and shelving in your closet can go a long way. With a small- or medium-sized closet, keep your paint color choice bright and light. With a large walk-in closet, consider using a paint color that complements the attached room. 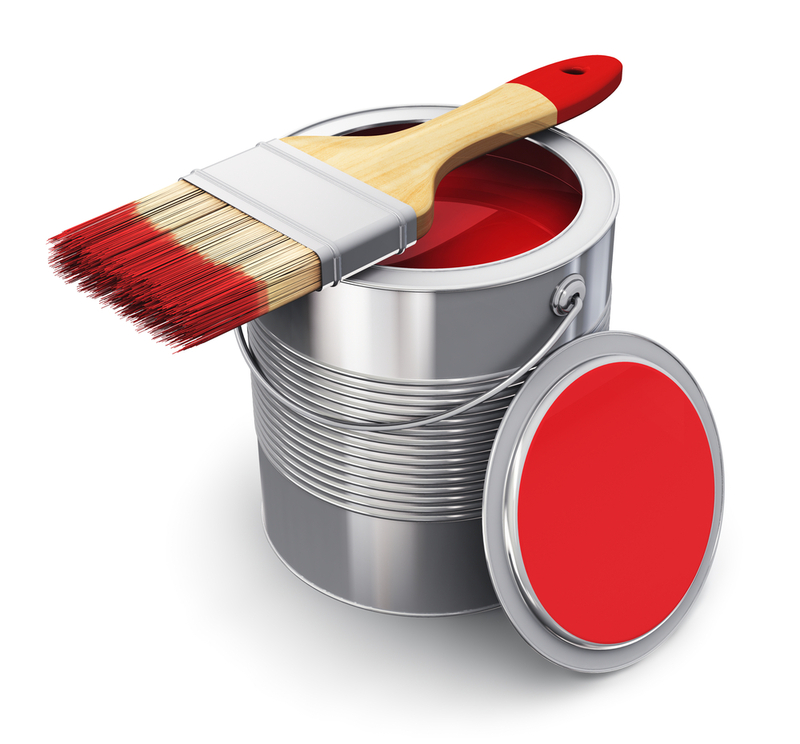 For shelving, use an oil-based paint for durability against scratches and scuffs. Hallways are typically long and narrow and, depending on the lighting, can also be dark. When choosing a paint color for the hallway, consider the paint colors in connecting rooms and then go one to two shades lighter. The colors will complement each other and coordinate the home’s overall design. Plus, a lighter shade will brighten up the passageway. If you have a small amount of paint and want to make the biggest impact on your home’s design, then an accent wall is your best bet. Choose a wall in your living room or master bedroom that you want to highlight, such as the area behind the sofa or bed. Once it is painted, hang coordinating artwork on the accent wall to finish the design. 7. Kitchen nooks and crannies. Typically, I find there isn’t too much paintable space in the kitchen. But when I do find it, it’s between the cabinets, appliances and backsplash. When space is limited, I always encourage owners to go bold and use colors that offset the room’s features. For example, in a kitchen with white cabinets and natural stone countertops, pick a hunter green or dark blue. In large quantities, these dark shades might feel overwhelming, but in small quantities, they give the room a strong dimension. You can’t avoid the task of laundry, so at least make it a room that is easy on the eyes and generates positivity. Think of a paint color you would never dream of using in the social areas of your home but would make you happy, such as a playful orange, a bold purple or a sunshine yellow. Who knows, being around your favorite color might even make the chore a little more enjoyable.